There were no links, of course. I never accused him of murder, much less three or four times. In fact, we had just had a pleasant chat in the Meet the Press green room in December, which wouldn’t be the case if I was bedeviling him with accusations of murder. The only time I ever mentioned the incident was this post in 2005, in which I discussed him as a potential Senate candidate. Note that there wasn’t an accusation of murder. In fact, I called the murder accusations “tin foil” (aka conspiracy theories). Yet Gary Condit got hounded out of polite society for a murder he didn’t commit, while Joe Scarborough got a show on MSNBC. As my tweets made clear, this was about media double standards, and it was about Scarborough trying to invent a scandal from nothing (as was the case with the conspiracy theorists and his deceased aide). One could disagree with those points, but to argue it was somehow an accusation of murder was bizarre, and of course, Scarborough was unable to back it up. Yes, after I became aware of the ugly cheap shot you took at Joe on Twitter, I asked the teams to take a break from booking you on our shows for a while. I found the comments to be in poor taste, and utterly uncalled for in a civil discourse. I’m hoping this will be only temporary and that the situation can be resolved in a mature fashion, but until then I just don’t know how one could reasonably expect to be welcomed onto our network while publicly antagonizing one of our hosts at the same time. The DailyKos community has been among the most supportive of MSNBC, and we continue to appreciate that support. I’ve criticized Chris Matthews before, sometimes harshly, and it never led to me being banned. This was not about criticizing some random MSNBC host, but about criticizing the network’s token conservative, a man who wilts in the face of the awesome power of Twitter and its 140-character limit. 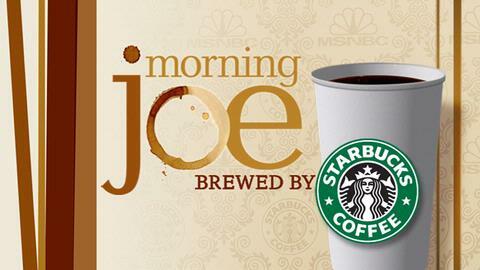 Morning Joe happens to be Griffin’s pet project at MSNBC. He’s staked his career on it, and as such, lets Scarborough call the shots — to the point of having its least successful host dictate the guest list of its most successful one. Look, it’s been good for Daily Kos to have me on, but it’s not my favorite medium, I’m often uncomfortable, and part of me would be grateful if I never had to do a TV spot again. I did as much MSNBC as I did because I like and respect Keith Olbermann and Ed Schultz. If they decided they didn’t want me on anymore, I’d be perfectly okay with that. However, I do think it’s noteworthy when I’ve been booted from the network because of a Scarborough temper tantrum. MSNBC is generally considered a liberal-leaning network, so the claim that a large liberal blogger has been banned has raised eyebrows. Moulitsas had been a semi-regular guest on Ed Schultz‘ show as well as Countdown with Keith Olbermann. We’ll see when he’s back. Interesting. Stay tuned for more on all the comings and goings at MSNBC. See, conservatives are expected to demonize the media, and can always count on being granted a platform by the same major networks they hammer publicly on a regular basis. It’s all part of the game, get it? But it seems Markos got publicly dressed down and banned by the president of the network, no less, all because he got under Scarborough’s skin with a few nasty little Tweets. This is what Markos is talking about: Back in the summer of 2001, Scarborough, who was divorced at the time, announced his intention to retire from Congress to spend more time with his children. Shortly after that announcement, an intern named Lori Klausutis was found dead in his Florida office. Scarborough responded by saying Kos regularly accuses Scarborough of being a murderer, which Kos disputes. I’m guessing he’s running for office again. After all, in today’s GOP if you aren’t picking up men in bathrooms, harassing pages by the dozen or hiking the Appalachian trail, you just aren’t worth the teabag you’re steeping in. I’ll be curious to see if any of the MSNBC hosts put up a fight. I doubt they will. There seems to be some kind of village Omerta when it comes to Joe Scarborough. What Kos is getting at here is that there appears to be a double standard, just as there was with the coverage of Levy/Klausutis, one driven by partisanship and ideology. And it’s all about the media giving conservatives a free pass. It may not be clear-cut, and there may be exceptions to it, but that doesn’t mean it isn’t there. Meanwhile, the Kos-Scarborough flare-up probably could have been handled more maturely, but it’s really only Kos’s first tweet that went a bit too far (if anything, he could have been more tactful). After that, it was Scarborough who lost it, throwing a “temper tantrum” and complaining to his boss (who “lets Scarborough call the shots” and so who was bound to side with his low-rated morning host). Regardless, it’s pretty stupid for MSNBC to blacklist a major progressive voice and new media icon like Markos Moulitsas. It would do well to rethink its priorities, and to think through its double standards.